Knee exercises are a great way to improve strength, flexibility and balance. They are one of the most effective tools for reducing knee pain. There are loads of different exercise plans out there for knee pain, but how do you know where to start? How often should you do them? How do you make sure you don't overdo it? Well, here we tell you everything you need to know to help you get it right so you can beat your knee pain, from where to start, when to stretch, how to work at the right level and how to progress as well as sharing loads of great knee exercise plans to get you going. 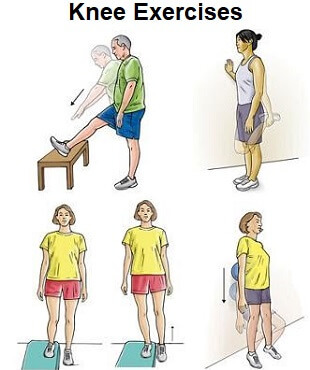 If you are suffering from knee pain, then nine times out of ten, the best place to start is with strengthening exercises. In virtually every case of knee pain, there will be some weakness in the muscles surrounding and supporting the knee joint. Simple strengthening exercises help to combat that. It's not just about strengthening the quads and the hamstrings. Whilst they are important, it's also really important to think about the glutes and calf muscles as they play an important role in strength and stability around the knee. In the knee strengthening exercises section, you will find exercises for each group of muscle, split into different stages, beginners, intermediate and advanced and will find advice of how to progress as your muscle strength improves. There are easy to follow instructions and videos and all the exercises can be done from the comfort of your own home, with no need for any specialist equipment. People with knee pain often make the mistake of starting with stretching their leg muscles. When there is muscle weakness in the leg, the other muscles around the knee try to compensate. They shorten and tighten up in an attempt to provide stability themselves to control knee movement. This can be helpful in the short term to protect the knee, but in the long run, the tightness may actually cause more problems so it must be addressed. Strengthening exercises should come first. If you carry out stretches without first strengthening the knee, you can actually cause more knee problems as you are taking away your body’s support structure making the knee less stable and putting more force through it. Therefore, I often advise people to start with strengthening exercises and then after a couple of weeks, add in knee stretches. Everyone is different depending on the cause of their knee problem, age, fitness level, and the strength of each muscle. My advice is start slowly and gradually build up. Start with a low number of repetitions of each knee exercise on day 1 and then stop – don’t be tempted to do more. Sometimes, it can take a few hours for post exercise fatigue and discomfort to settle in. If the next day everything feels fine, next time increase the number of repetitions by 1 or 2. Then wait 24 hours and see how you feel. Not working hard enough: If an exercise feels very easy, you probably need to push things a bit more. Getting it right: As you do the exercises it should feel like you are working reasonably hard, but shouldn’t be too painful. Any discomfort should stop within a few minutes of stopping the exercise. Re-evaluate regularly, aiming to progress your knee exercises approximately every three days. 1) Repetitions: The simplest way to progress an exercise is to increase the number of repetitions that you do. 2) Weights: Another simple way to progress strengthening exercises is to add a weight (e.g. ankle weights, or wear a shoe). When you do this, it is a good idea to reduce the number of repetitions you do of the exercise and gradually build them up again as the muscles are working harder. 3) Extras: Sometimes there are clever ways to increase the difficulty of an exercise e.g. adopting a different position so look out for these in the knee exercise plans. I also recommend checking out the Getting The Most out of Knee Exercises section for top tips on how to ensure the best results. 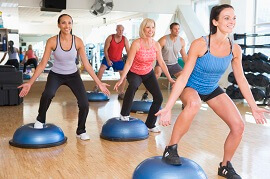 These knee exercise plans incorporate strengthening, stretching and balance exercises and are a great place to start. You can choose from beginners, intermediate and advanced. Quads stretches, Hamstring stretches, Calf stretches, Glutes stretches and ITB stretches. Remember, if you are suffering from knee pain or are about to start on a new knee exercise programme, always make sure you consult a doctor first.